The Membership Committee is pleased to announce the kickoff of its 1,000 Member Campaign! The goal of the campaign it to assist NAHSE in increasing its membership to 1,000 financially active members before the 2015 Annual Education Conference in New Orleans, LA. 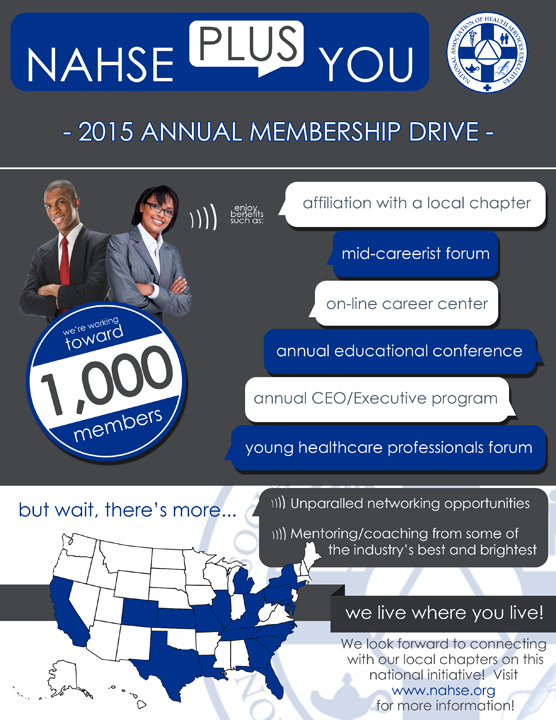 As of December 2014, we were 723 strong, leaving us only 277 members short of our goal. As a special incentive, we are offering $1,000 to the chapter that increases its membership by the largest percentage! Yes, you read it correctly, $1,000 ladies and gentlemen. The monies would be used to fund the chapter’s sustainability initiatives (i.e. scholarship, internship, etc.). The competition will run from January 1, 2015 through September 30th and the winner will be announced during one of the conference’s featured events. In an effort to keep everyone abreast of their performance and how they’re fairing in the competition, updates will be sent on a monthly basis highlighting how we’re progressing in our 1,000 member drive. Included will be a breakdown by individual chapter increases to keep our friendly competitive juices flowing! 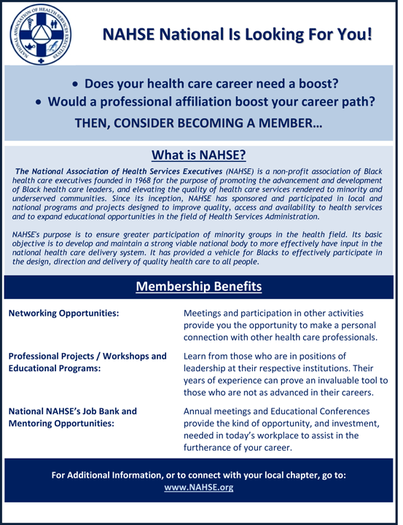 Attached is a copy of the flyer advertising the membership drive along with a document summarizing the history and a few benefits associated with NAHSE membership.